So they say that “necessity is the mother of invention”. I haven’t been inventing things lately, but I had a lot of necessity the past few days for mapping software, flight availability software, and things of this sort. During the process of doing a thorough comb of the mapping and flight reservation universes on the web, I came across an assortment of tools that I thought I would share with you. Here’s the first one. Flash Earth. The concept is simple: take every available satellite imagery database and make it easy to fly around and switch between the images. Flash Earth is basically Google Earth, or is that Virtual Earth? Actually, I guess it is both! 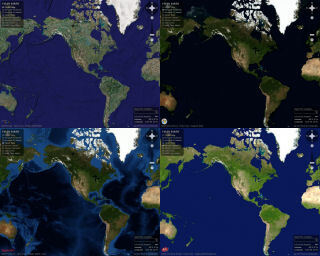 The image above shows the globe from the perspective of (clockwise from upper left): Google, Microsoft, Ask.com, and Yahoo. What’s cool about this is that some of the mapping services have high-detail in one area while others do not, and some have more recent images than others. For example, looking for the Burj al Arab in Dubai, you will find a very high-resolution in Google but not in Microsoft. However, the Microsoft image of the Rincon Towers construction site (in San Francisco) shows the beginning of construction, while the Google image shows the Bank of America building which was formerly on site! I love this tool. Check it out! ← Ten Worst Toys Ever!